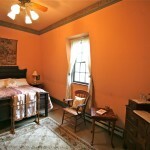 This cozy upstairs room on the rear of the house is just steps from its shared bath. (Terrycloth bathrobes are provided.) Here you’ll find the best view of Newbury Pond and may hear the soothing sounds of some of its birds and frogs in season. Emily Hughes was founder Thomas Hughes’ niece, who came to Rugby from England to live here with her “granny,” Margaret Hughes, in the still-standing Uffington House. She experimented with photography, grew grapes and mulberry trees for her silkworms, and was active in Rugby dramatic and music pastimes. Emily eventually moved to Kenya, where she died and is buried. Her photographic portrait hangs in the room.